The old saying, “Those who fail to learn from the past are doomed to repeat it” has been going around a lot these days, fueled by the recent crazy right vs. crazy left turmoil in Charlottesville (and other places). And there has been many a historic statue defaced or pulled down in the heat of the controversy. It seems like every day we hear of a new damage report. It’s been well documented – and it’s sad. But history is about to repeat itself again in the Senate starting next week and this time the reference point isn’t even half a year old. I’m speaking of the debate over the filibuster, the non-constitutional senate tradition that empowers the minority to delay or completely stop the will of the majority. Commentators spent weeks debating the merits of the parliamentary tool during the confirmation hearings of Justice Neil Gorsuch, with Senate Majority Leader Mitch McConnell ultimately persuading every member of his caucus to vote to permanently disable it (for Supreme Court nominations). Even stodgy old stubborn “maverick” John McCain went along with the move, basically reasoning that the stalling actions of a nearly-united Democrat minority against the elevation of a good man like Gorsuch to the Court was too much even for him to bear. So the Republicans torched the filibuster in that instance. 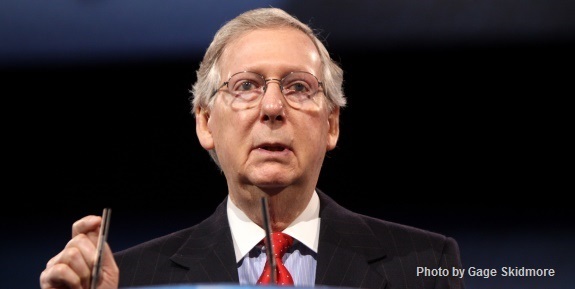 Conservatives and Republicans hailed McConnell for his principled stand. Democrats said it would irreversibly tarnish the institution where comity, compromise and consent were the tradition. Hogwash. Anyone with a brain (and a memory) knows the Democrats would do exactly the same thing if they were in the Republicans’ shoes. There is no principle on the Democrat side of the aisle anymore – all they want to do is obstruct. At the time both sides swore the axing of the filibuster was strictly limited to the matter of Supreme Court nominees and that the vaunted legislative filibuster – which requires 60 votes to end debate on a bill – would be preserved for all time. McConnell, McCain, Lindsey Graham and other establishmentarians spoke eloquently about the collegiality of the senate and how senators from both parties needed to work together to form consensus on major legislation. Hogwash again. There’s only one problem with this line of argument: with politics in its current heavily divided state, getting all the Republicans plus a minimum of eight Democrats to agree on anything is nearly impossible. If you don’t believe it, just look at the recent kerfuffle over repealing and replacing Obamacare. The result? Nothing gets done. Administration nominees still aren’t being confirmed and the pace of legislating makes a receding glacier look speedy; and Americans are getting impatient. Is history about to repeat itself? President Trump hopes so, at least where the legislative filibuster is concerned. Louis Nelson of Politico reported last Friday, “President Donald Trump on Friday once again renewed his call for the Senate to do away with the legislative filibuster, a step Senate Majority Leader Mitch McConnell has vowed never to take. Note even one, Mitch? I bet if you polled a few of the principled conservatives in the body – Senators Ted Cruz, Rand Paul and Mike Lee, for example – you might get a different answer. McConnell also indicated (at the time) he would never move to ditch the legislative filibuster while he was Majority Leader. Who knows whether McConnell’s begun to change his thinking on the topic, but his entrenched position was announced prior to all the trouble he encountered in confronting the Obamacare issue. In his article Nelson also pointed out that Republicans have had difficulty corralling even 51 votes for various proposals which is partly due to McConnell’s lack of leadership along with the party’s establishment’s tolerance for wayward members. If a little discipline were imposed I’m guessing some semblance of harmony could be reached. Nobody likes to lose and that’s exactly what’s plagued the senate majority ever since Gorsuch was confirmed just before Easter in April. Practically everyone in Republican-land is upset with McConnell to the point where even his buddy Speaker Paul Ryan is kicking the senate for its hard-earned inept reputation. For his part McConnell has spent the last several weeks enduring Twitter salvos from the president who publicly wonders why the senate has been so dysfunctional. Getting rid of the legislative filibuster makes a lot of sense, even when taking into account the future ramifications when Democrats hold a majority. But whoever said McConnell cares about common sense? He’s got the Washington establishment to satisfy and the ruling class doesn’t give a hoot about how much Trump struggles just as long as the government keeps loot flowing to the special interests. So, chances are the upper chamber’s management will do nothing. The impasse has a lot of people clamoring for a change in leadership (in both the House and Senate) and calling on Trump to take the lead in demanding it. Tammy Bruce wrote last week in the Washington Times, “[T]here’s a reason Republicans control the House and the Senate and the White House. Americans want action on Mr. Trump’s agenda and the most basic of conservative issues: improving the economy, jobs, domestic and national security. Finger-pointing is not what the American people voted for. “For Mr. Trump’s agenda to be pursued, he needs leadership partners in Congress. It’s time Mr. Trump used his considerable influence with the American public and his own party to help facilitate a leadership change. In her piece Bruce notes that Trump’s approval numbers are much higher than those of Congress and McConnell’s personal rating has fallen through the floor since Trump took office. Mitch isn’t even getting much love from his native peeps in Kentucky these days. The notion of jettisoning the filibuster should therefore be much more attractive to him and it will be interesting to see what the senate GOP leadership does about the issue in the coming weeks. They certainly can’t count on cooperation from any Democrats to do it and it’s highly unlikely McConnell could convince the “moderate” Republicans to vote to end it. In other words, the prospects for success aren’t promising. It’s conceivable Trump could be using the issue to gain additional leverage in the upcoming battles over the budget and raising the debt ceiling as well as laying the groundwork for intraparty primary challenges next year. The president isn’t known for his patience and Trump was elected to break up the status quo, not preserve it. Perhaps for that reason more people are starting to weigh-in on the rumors Trump will be impeached if the Democrats gain the opportunity. Longtime Trump friend and adviser Roger Stone made waves last week by forecasting a civil war would breakout if Trump was tried before the public in such witch hunt fashion. Cristiano Lima of Politico reported, “During an interview with TMZ the former Nixon administration official and old friend of Trump's cast talk of impeaching the president in response to the ongoing government probes on Russian election interference and alleged collusion as merely a distraction from the Democratic Party's 2016 defeat in the presidential election. “He went on to warn that if impeachment proceedings were furthered in Congress, as some House Democrats have called for, an ‘insurrection’ would take place nationwide. Never one to mince words, Stone further explained he wasn’t advocating violence, just predicting it would occur because gun ownership is way up in the country (on both sides) and supporters wouldn’t stand idly by while their president was dragged before his liberal establishment inquisitors (Stone also said those who voted to impeach Trump would be endangering their lives). Naturally Stone drew a hailstorm of condemnation from Democrats and #NeverTrumpers for his controversial opinions. Susan Wright at RedState commented, “To be honest, I don’t know that I can honestly say I disagree with Stone’s assessment of where we are as a society, right now. All of this could be alleviated by Republicans simply doing what they said they would do during the campaign. Ending the legislative filibuster would go a long way towards accomplishing this end, but it’s just a start. In this sense history repeating itself would be a very positive thing, indeed.